Devon & Jones D700 Men’s Three-Season Classic Jacket has a 100% taslon nylon shell with plush microfleece lining and lightweight polyfill insulation. Lightweight polyfill insulation provides additional warmth. It features a drawcord hem and sturdy Black enamel front-zipper, raglan, nylon-lined sleeves, outside zip pockets and inside zip security pocket. 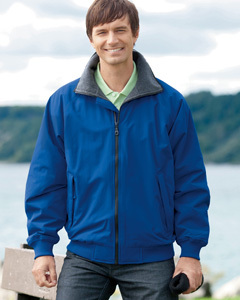 A banded bottom hem and sleeve-cuffs along with nylon neck bindings snug-out drafts and a track-stitched storm flap will never curl – no matter how long you own the jacket. Water-resistant outerwear repels initial moisture through tightly woven fabric coating and provides you with protection from light rain, spilled drinks or other short-duration events. When the weather turns seriously cold, lined outerwear doubles up the protection with a wind- and water-resistant outer shell over a poly fleece lining that holds in your body heat. This double duty weather protection offers three seasons of wear from late fall through early spring. Prices listed are for blank jackets. Email info@crookedbrook.com the quantity, color, size breakdown, ship to address and attach the artwork for your logo or design. After we review your information, we will get back to you with which method of customization is best for you and a quote.